In a recent article here at Blender 3D Architect, I was mentioning about the number of assets you need for both a kitchen and dining room. Just a couple of days ago you had the change to download a free dining table set for Blender, to help with that type of visualization. Do you also want to download a free vintage kitchen set for Blender? 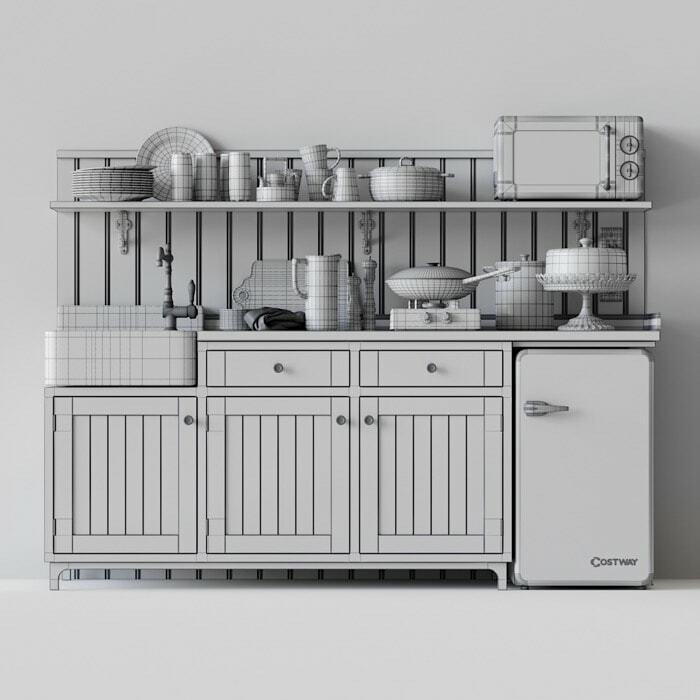 An artist called Vladimir Radetzki posted on his Behance account a model that might help you in a kitchen visualization. It is vintage furniture set with lots of small assets for that type of scene. In the description, you will notice that he didn’t use Blender for the modeling. The page lists 3ds Max and Corona as the tools for making the images. However, since he was kind enough to also offer the assets in a more friendly format like FBX and OBJ, we can easily import the models to Blender. You will find a lot of assets for kitchen scenes in the file. Just keep in mind that not all of them will fit in a modern kitchen. What about the licensing? According to the artist you can use the models in commercial projects with no restrictions. The only limitation is with redistributing the assets, which he doesn't allow.